The okra plants have gotten about four feet high and finally set fruit. If my garden was larger, I would have planted it with the tomatoes and probably been harvesting for a month by now. Of course okra grows really well in high heat — we set a record here of 114 last week — and this summer is not disappointing. 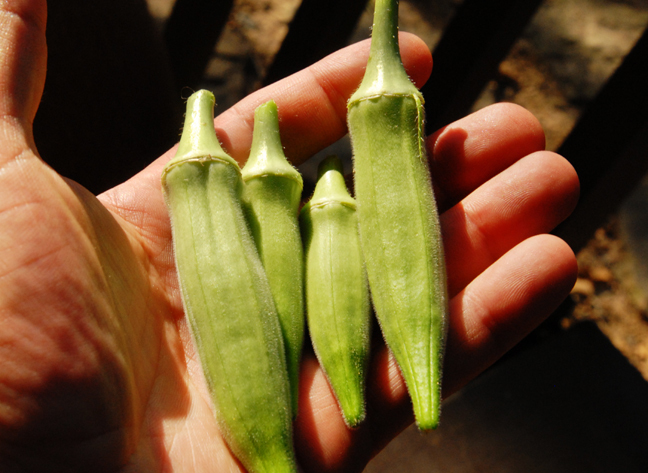 The easiest way to harvest okra is to cut them off with sharp scissors about 1/2″ from the base. Watch out for the leaves and stems of the plant because they are prickly. Always harvest okra before it gets longer than 2 1/2″ or it will become hard and stringy when eaten. Young okra works well in gumbo, fried, pickled and stewed. By the end of the season, I will probably post a recipe for each. This entry was posted in Food, Garden and tagged gardening, okra. Bookmark the permalink. Informative and cool photos as I have never seen an okra plant! Looking forward to those recipes! Especially the gumbo! Okra is one vegetable I don’t have much experience with. Living where I live you don’t run across it much. Looks great though! Though not really a fan of okra, I am a fan of your gardening expertise. You’ve got quite the green thumb. Like eggplant, no seems to be able to take or leave okra. I just don’t know when you have time to work! Your garden sounds like a wonderland of continually ripening deliciousness – envy, green with it. In my down time, I spend loads of time in the kitchen or garden. I guess that may be obvious. Okra is definitely not my fav BUT do you know how crazy my mom went when I showed her this (even when she should be sleeping lol). She LOVES okra and loved this post. Your mom is the penultimate Southerner. Katherine’s mom used to fry it growing up and only make enough for her and her husband. The kids wouldn’t eat it. I can understand why they didn’t eat it lol… I;m surprised mym other isn’t emailing you right now asking you to send her some LMAO. I can just see that email now lol. Our neighbours in Mauritius grow okra (lady fingers as they call them) on an entire open plot of land each season. Strangely it’s not one of my favourite veggies. Yours is beautiful and healthy. Wow those okras look good, I never see okra that good here in NZ, they look like dry your looks so plump and juicy! I have never seen an okra plant before. Can’t wait to see your amazing creations! I tasted okra for the first time only a couple of weeks ago. I really like it the Japanese way. I was a bit worried about the sliminess at first, but I don’t really mind it. Looking at your fresh okras I now realise how “tired” are those I buy in Switzerland (imported from Thailand). The flower is very decorative! I thought you stuffed and fried these guys. Perhaps, I’m recalling wrong. I’ve eaten okra but never seen the plant. Very cool. Looking forward to those recipes! I love fried okra myself. Interesting photo. I love okra, looking forward to your recipes on how to prepare it. So beautiful… I have a harvest stew that I prepare in October that stars okra. I just love the mucilaginous nature of this vegetable and find myself, once again, completely jealous of your gardening abilities! Cheers. I think you’re the first commenter ever to use the word mucilaginous! Ha, that’s so great. I can’t wait to see your stew. I’ll have to salivate over yours, I suppose! Ha, I had no idea. Thanks! It’s a stew that starts with a roux, comes from the bayou! Beautiful! 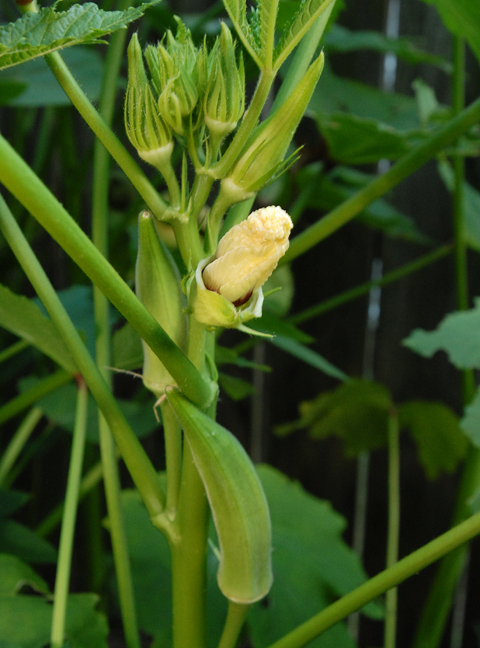 My friend Vickie, http://www.montana2.wordpress.com just posted an okra bloom photo. I’ve never seen one and it’s GORgeous. Okra has just hit our farmer’s markets, I’ve been making okra, sweet corn, corn meal stirfry, topped with a bit of smoked paprika. OHYgosh good. Thanks for sending me there. She has a great blog. You’ve got some nice lookin’ Okra thar sug! Hee, hee. Why thank you! I love it sliced and fried . . . with grits on the side. Yummy! Great photos! I’ve not used okra much at all so I’m looking forward to see what you two are going to be posting with this little beauties! I think we´ll have to grow some okra next year as it likes the heat. Will have to look out for seeds or buy them in the UK…am looking forward to your recipes! Looks wonderful and congrats on the first harvest! Besides green peas, okra was my favorite vegetable to eat growing up. Looks like a great crop! How did your parents make it? I never knew ocra grew like this picture shows. I confess I always thought it was a water plant like water-cress and lotus. I never thought about it until I had a garden. Oh that does sound great! Ya know what? I’ve never tried okra! I always see it at the farmer’s market or grocery store but just don’t know why I don’t take the time to try it. Hmmm, I’ll wait for you and Katherine to post a recipe for me to try for my kids! Awesome. Dying to know what you’re going to do with your crop! A little fried action, perhaps? Pan fried maybe. No deep fryer in the house. ooh i love okra! can’t wait to see what you make! I look forward to the recipes – I love okra! Oh my goodness, 114 degrees… Well, at least your plants are thriving, though I must admit, I’ve never tried okra. It’s kind of hard to find around here, but I’d love to see what it tastes like. If you do post okra recipes I’ll have to seek it out and give it a try (especially if it’s fried!). Dude, as much as I hate okra, this post of yours’ make it sound so good. Nice blog dude!!! Ha, thanks. I know it has plenty of haters. If it didn’t grow so well down here and I didn’t have Southern in-laws, I’d probably be in that camp. Thanks for stopping by will check out your site. I love okra! I’ve seen people make them into “fries” by baking them and while I don’t think they actually compare to fries at all, they still taste pretty darn good! I love deep-fried okra – but have never made it myself! Another thing to add to the to-do list! I enjoy okra as much as anything in the garden. I freeze a lot of it, too, for the winter months. Oh maybe I’ll make gumbo just so I can say gombo gumbo! Boy, do I love fried okra. My mother usually makes it as a treat when we visit in the summer (since that’s our only chance to have it all year long). Looking forward to living vicariously through the recipes you’ll post! Oh!!! You even have okra in your garden!!! I go nuts for okra!!!!! !